It has been about 10 years people know about Google Webmaster Tools. It has been changed now, Google has replaced Google Webmaster Tools by “Search Console”, is change comes as a result of user feedback. Its words given below of some important person working in Google as a Webmaster Administrator. Many users will be confused not finding webmaster tools; once again it will be surprise for all Google Webmaster users. It will not be difficult to use webmaster. Its name has been changed only; all functionality is same as my using concerned. 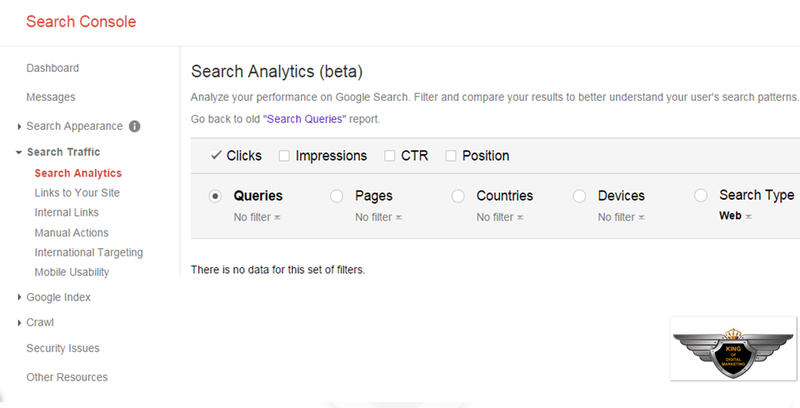 Only Search Analytic has been modified in it, shown below in Image. It may be possible to make some changes in future in Search Console by Google. We at King of Digital Marketing will also update updates of Search Console. So there’s nothing new to learn now. Be patens about updates, we are Delhi based SEO Company for services and training. We will update all news related to SEO SMO and PPC. Visit our website www.kingofdigitalmarketing.com SEO Services in Delhi. Last years Google change the name of Google webmaster with Google search console. Google Search console is similar to google webmaster, only Google change its name. From digital marketing point of view this is consider to be one of the most important tool. It provides detail information about indexing, crawling, searching and many more. We are a known digital marketing company india offering almost every types of digital activities. Unique article. Keep sharing articles like this.